In April 2015 and 2016 iWycombe showed you the upcoming events for the fabulous Wycombe Fringe Festival. iWycombe is your go-to app for finding your way around High Wycombe’s food and entertainment venues. If you’ve made a twitter post mentioning iWycombe, it should show up in the Community section of the app for 6 days after you posted it (that’s how long Twitter keeps recent posts in searches). If you don’t see it, then the reason might be that Twitter is filtering out posts made from your account, probably because you haven’t filled in enough details on your profile. If you think this applies to you and you’d like help with sorting it out, drop us an email or post a comment here. Thanks to all of you who discovered it on your own and have downloaded iWycombe so far. Some text content was taken from Wikipedia. Where text has been taken from a location’s web site, it has been attributed in the description of that location. And two tab bar icons came from “icons by Joseph Wain / glyphish.com“. 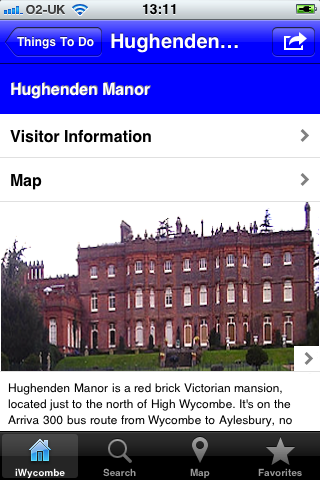 The loading screen map comes from Wikimedia Commons, as well as some images of Hughenden Manor. I can’t finish without saying that most of the text and photographs came from Elizabeth Lynch, using her iPhone 3G and iPhone 4. This post is your guide to iWycombe, with screenshots as promised. On first launch, you’ll see a list of categories and a few special functions, as well as a tab bar across the bottom which offers different views – this tab bar stays with you across all views. The main items are a list of categories to explore: Food & Drink, Things To Do, Shopping and Links. You can also choose to view by subject, which is just a different way to group all the entries for places. There is also a short summary page about High Wycombe, which may be familiar if you have ever looked up High Wycombe in Wikipedia. The last element on the front page list is “Community”. From this screen you can keep up to date with events in High Wycombe by reading tweets sent by us, but you can also participate and help to build a local community by posting to and following the #iwycombe hashtag within the app, or just by viewing local tweets within the vicinity of High Wycombe. You can post and share things from within the app by email, Twitter, Facebook or Tumblr, and we hope to extend this in due course. The tab bar offers a quick return to the home screen, a search tab, a map, and a favourites button. In the Search screen you can scan all entries within their title or description. 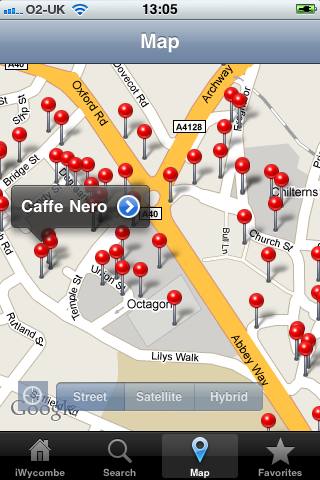 The Map screen shows a view of all locations within High Wycombe, optionally showing your location as well. Favourites show you a list of places that you have bookmarked, as well as a list of places you have visited recently. When you select a place to view, there is a description of the location, a picture (and possibly a picture gallery), and contact information – address, phone, web site and other information if it is available: such as opening times for shops. You can look up directions to any location that you are viewing from your current location, which uses the iPhone’s standard Google Maps application. We’re at the stage I like to call “feature complete” – meaning that everything I want the app to do is working and mostly debugged, but we’re still going through design updates and editing content. As for that content, every location we decided to include is there, with details completed and a guide written up; a few are still missing photos, and the content text is getting an editorial review. So what does that give us? (from the features perspective) A searchable database of locations in and around High Wycombe, eclectically selected by Liz, with a flexible set of fields attached to hold standard contact and review information about every one of those locations, including geolocation and photographs. We track your favourite locations, and can record visits to those locations. Tap to phone, open web sites, or share information via email, Twitter or Facebook. Or tap to view the location on a map view, with all the goodness of iPhone’s Google Maps integration, or jump out to get directions from your location to your destination. We’re open to suggestions, for features, style and content – and to that end have included a Feedback option on the front screen. 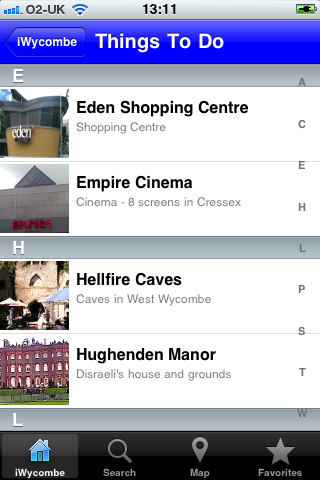 Coming soon: iWycombe, the iPhone app for High Wycombe (Bucks, UK – not the one near Perth, Australia!). It contains information about local attractions, shops, entertainment, events and relevant web sites, with useful information and reviews. You can browse by category, or search the database for individual words. All locations are visible on a map view of the area, with your own location highlighted. Locations of interest can be bookmarked as favourites. iWycombe is “Community enabled”, which means that you can see a Twitter feed from @iWycombe, but more importantly can follow and post to the #iwycombe channel, and see tweets from posters in the High Wycombe area. We will post some screenshots soon, and hope to be able to submit the app for approval in the next few days, after (yet another!) round of reviews and edits to make sure that our content is up to date and accurate.